With vegetables coming in at local markets, this seemed like the best recipe to kick start this blog. Everyone that’s grown up in the south has experienced squash casserole. I personally have been eating them all of my life so when I set out to create my own version of a squash casserole, I knew what I liked about it and what I would like to change. My grandmothers both made wonderful squash casseroles but they were your typical style, starting with boiled squash and by the time the casserole was made it resembled mashed potatoes. The flavors were great, but the texture was never to my liking. I prefer the ingredients of my dishes stand on their own and I love summer squash, so I created this recipe. Not only is it easy to prepare, it’s praised by everyone that’s had it. It sells out every time I make it and I constantly have customers placing orders for whole casseroles they can serve at home. 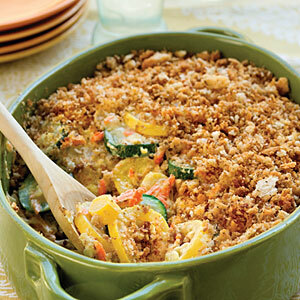 Place squash and onion in a casserole dish with a lid, with 1/4 cup water. Cover and microwave for 4 minutes, or you can boil, but make sure the squash isn’t over cooked. You want it to resemble squash and not be mushy. Drain well. In a large bowl combine the squash and onions, mayonnaise, sour cream, cheese, salt and pepper and blend well. If more “sauce” is needed, simply add more mayo and sour cream in equal amounts to get a soupy consistency. Pour into a lightly greased casserole dish. Top with the crushed Ritz crackers and drizzle top with butter. Bake at 325F for 25-30 minutes or until casserole is golden and filling is “set” (not soupy when you wiggle the casserole dish). The casserole can be pre-made and refrigerated for a couple of days before cooking. Simply leave off the cracker top until just before baking. This entry was posted in Vegetable Side and tagged casserole recipe, squash, squash casserole, squash casserole recipe by quarlj01. Bookmark the permalink.